The long-awaited reveal -- resin pendants made with Zack, among other things! First, a collage of the pendant that are currently for sale on Zack store, ZackAttackArt. Two of them have eensy little blurs, so we reduced the price of those. All come with extra coordinating beads Zack and I will pick out for you. This is a pendant Zack decided to keep. 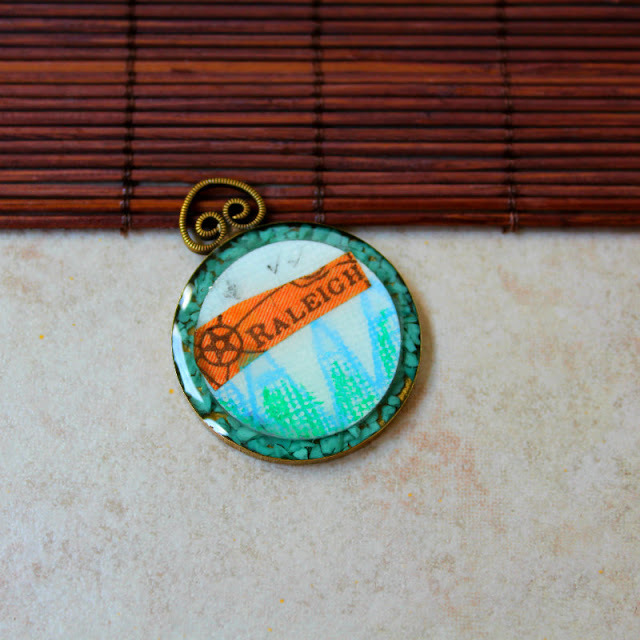 He cut apart a vintage map and for some unknown reason chose "Raleigh" as the city. We've never BEEN to Raleigh. I poured glass frit in the bottom, and Zack drew a picture of mountains. Oh, well, he did give one of the "oopsies" to a friend. Then we tried our hand at treasure bottles. These bottles are made from old glass containers contact lenses used to come in (remember that?). Unfortunately, when I resined the buttons on the top, it dripped, so we're going to keep these in Zack's treasure box (an old printer tray). 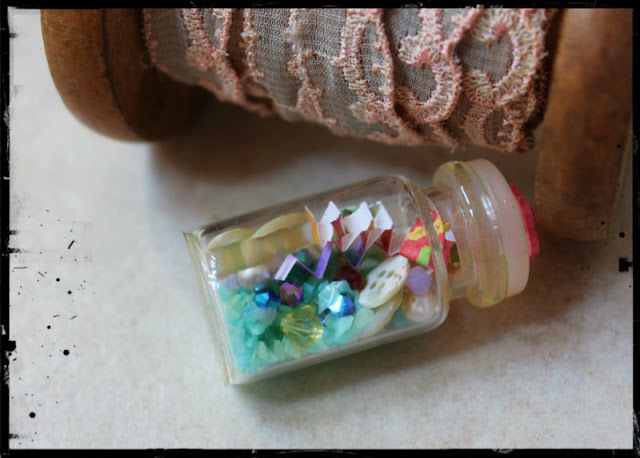 The next bottle is sort of a fairy-tale bottle, full of glass frit, Swarovski crystals, folded pieces of paper, and vintage buttons. We're keeping this one, too. I learned something -- there's a static field on those tiny rhinestones I tried to set in the button holes, so next time, I'll glue those in FIRST and THEN use the resin. 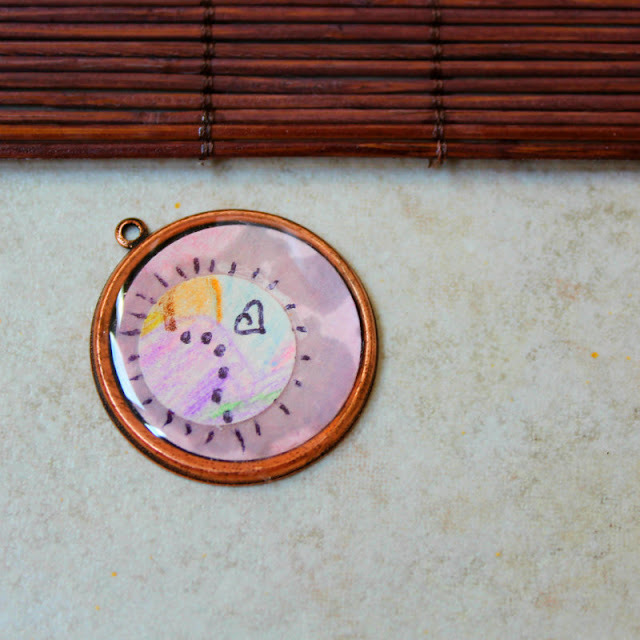 I also have two more vintage button pendants that aren't finished yet -- I'm going to resin paper onto the backs of these as there is a shallow bezel on that side, and the deeper bezel on THIS side. Once again, the rhinestones flipped over, but they still look pretty cool. Will there be any interest in any of these, I wonder? and grab one of the hour available! Don't forget, free beads come with each pendant! I can't wait to try more resin! That Zack is very talented! Love those button ones of yours as well! These all turned out great!! I love what you and Zack created. I am glad you both enjoyed this time together. I checked out Zack' s shop. I am so jealous of his sales! I can guarantee people will be interested in BOTH yours and Zack's beautiful pendents! And hey, those oopsies are unique learning experiences! For the "oopsies" he can paint on top of them with gold leaf pens, alcohol inks etc to cover up and hide the oops areas then paint on a thin layer of resin to seal. I sometimes cover up small bad areas with Swarovski crystal flatbacks or flat back rhinestones. Lori, I love these! 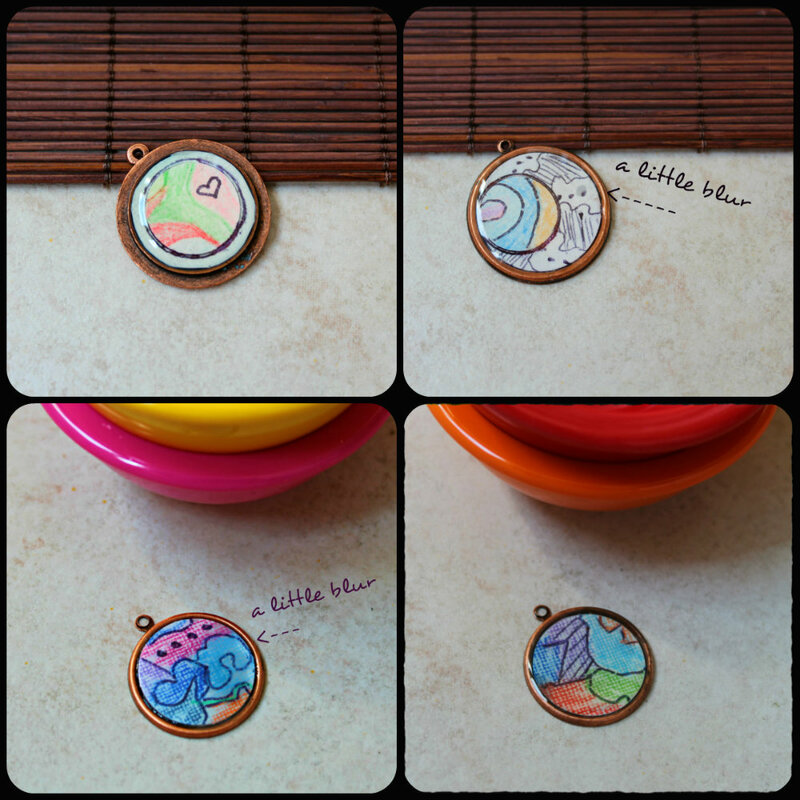 Do you buy the base pendants? Or did you make those? Fun time you had and fun pieces you created! And yours are very lovely as well, Lori. I adore the heart in particular. This is a very fun summer time project and the results are fabulous. Good on ya, Zach! You too Lori. Love those buttons in resin. Amazing work by Zack! I love all the mixed media work. Looks like they sell out quickly too. You might want to verify if the rhinestones actually flipped, or if the melted into the resin. Some plastic rhinestones don't take too well to resin and all you see is the backing. I love them all...and the treasure bottles are so fun. I haven't seen one of those contact bottles in ages! Also, love your vintage button pendants. I love that you are creating these together- what wonderful memories!!! Great job! I love them all!! Zack is doing a wonderful job creating these beautiful pieces, with your help of course, that I am sure he will be sold out in no time. It is so wonderful to watch your child's creative tendencies come to life. Well done Zack! I see you are sold out in your Etsy shop too. What a fun day of creating! I love everything you and Zack made. Great first time job for Zack. It's taken a bit of experimenting for me, too. I have a resin tutorial in the June issue of Bead Trends. Try this: one coat of sealant (Nunn Design sealant, gel medium, Mod Podge) to glue the paper into the bezel with three coats on the top, drying thoroughly in between. And then like Cindy Cima said, glue a flat-back crystal over the spot that bled. I've also read that gel pens write on resin; then another coat to seal. I've used those same square bezels from Nunn Design. Even though Becky didn't intend for them to be double-sided, I do both sides, too. And in fact, the piece published in Bead Trends uses that bezel. I think you guys knocked it out of the park! Resin can be fun, and can also be frustrating when you ruin gorgeous collages and painted things like I have!! Good job!